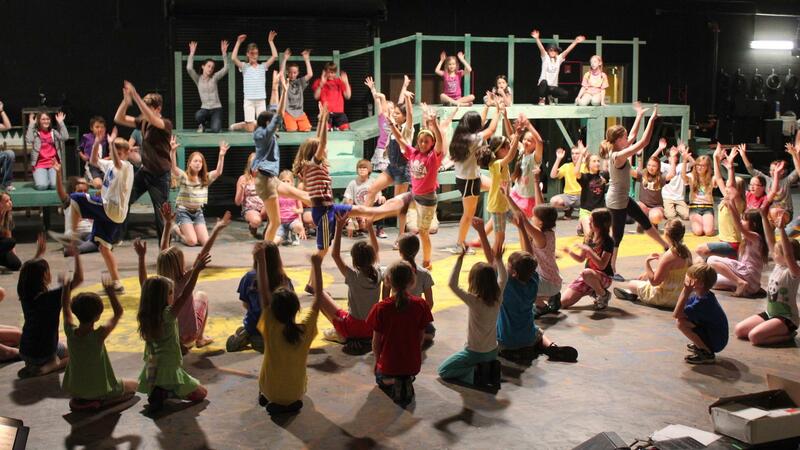 Children rehearse for a production of The Wizard of Oz at the Lawrence Arts Center in Lawrence, Kan. When Kansas faced a tight budget last year, Gov. 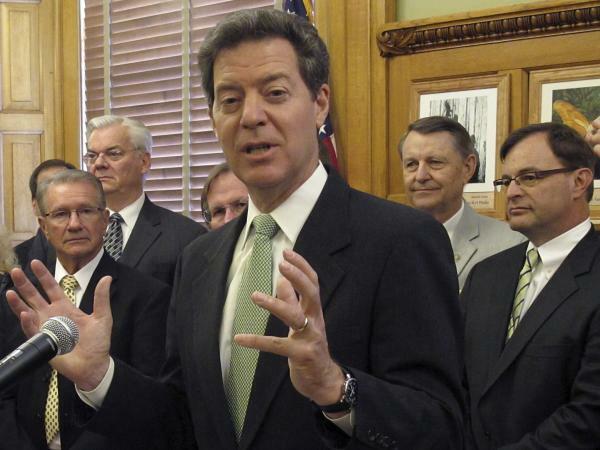 Sam Brownback cut the state's arts funding. Eliminating state funding last year affected hundreds of arts organizations. Arts supporters did not take kindly to the proposal. A rally opposing the cut drew hundreds to the Statehouse, and this year, Brownback's administration reversed course and restored some funding for the arts. It proposed a new group called the Creative Arts Industries Commission. The governor's office says the focus of the new organization will be economic growth through art. At the Lawrence Arts Center, dozens of children, mostly grade-school and middle-school age, flood in for summer programs. Just down the hall, about 50 children practice a song from The Wizard of Oz. The arts center sustained a $24,000 cut and Margaret Morris says it had to cut a handful of jobs and find private funds to help cover the loss. She says it can be easier to find money to help sponsor high-profile programs and children's programs, but it's more difficult to pay day-to-day costs. "The hard place to find money for is things like toilet paper, paper towels, electricity bill, your water, things like that," Morris says. "So that's where that Kansas Arts Commission money really came into play for a lot of places." When the state cut around $700,000 in funding, it meant that Kansas was no longer eligible for more than a million dollars in matching funds from the federal government and a regional arts agency. Some smaller arts groups are still struggling. "It was a big impact for us, and actually, for this next year, we will be operating at a 10-percent deficit for the first time in the history of the choir," says Jane Roesner Graves, executive director of the Lawrence Children's Choir. Her group will soon be asking the City of Lawrence for money to help cover the shortfall. The reinstatement of funding is "very much an example of how the people spoke and their voices were heard," says Sarah Fizell, with the advocacy group Kansas Citizens for the Arts. "I mean, this was thousands of advocates who worked really hard over the last year and a half to explain why the arts were important in their communities, to explain what this meant in their lives," she says. "And I really believe that that voice was heard by the governor and by legislators." But there's still plenty of uncertainty. The move puts Kansas back on track to restore matching funds, but arts groups could still have a difficult year ahead. Kansas likely won't be eligible for arts matching funds until mid-2013. Kansas last year became the first state in the nation to completely eliminate arts funding. Copyright 2012 Kansas Public Radio. To see more, visit http://kpr.ku.edu. And if you're just joining us, you're listening to WEEKENDS on ALL THINGS CONSIDERED from NPR News. I'm Guy Raz. Some good news now for arts groups in Kansas. Yesterday, Governor Sam Brownback restored $700,000 to fund the arts. That reversed a controversial decision last year that made the state the first in the country to eliminate arts funding. Art supporters in Kansas are celebrating the reversal. But as Kansas public radio Stephen Koranda reports, that lost year of funding did not come without a price. STEPHEN KORANDA, BYLINE: Republican Governor Sam Brownback has always said he supports the arts, but when the state was facing a tight budget last year, he said Kansas needed to cut back. GOVERNOR SAM BROWNBACK: As we look to grow Kansas' economy and focus state government resources to ensure the most efficient use of taxpayer dollars, we must do all we can to protect the core functions of state government. KORANDA: But art supporters did not take kindly to that proposal. UNIDENTIFIED MAN: We deserve and require the gifts that art brings to our lives. And at 29 cents per year per Kansan, it's a bargain. KORANDA: That rally opposing the cut drew hundreds to the statehouse last year. Brownback's administration changed course this year, proposing a new group called the Creative Arts Industries Commission. The governor's office says the focus of the new organization will be economic growth through art. Eliminating state funding last year affected hundreds of organizations, like the Lawrence Arts Center. Dozens of children, mostly grade school and middle school age, are flooding into the arts center here today for summer programs. Just down the hall, about 50 children are practicing a song from "The Wizard of Oz." UNIDENTIFIED GROUP: (Singing) ...your way home (unintelligible). KORANDA: This arts center sustained a $24,000 cut. Margaret Morris says it had to cut a handful of jobs and find private funds to help cover the loss. She says it can be easier to find money to help sponsor high-profile programs and children's programs, but it's more difficult to pay day-to-day costs. MARGARET MORRIS: The hard place is - to find money for is things like toilet paper. Paper towels, electricity bill, your water, things like that. And so that's where that Kansas Arts Commission money really came into play for a lot of places. KORANDA: When the state cut around $700,000 in funding, it meant that Kansas was no longer eligible for more than 1 million dollars in matching funds from the federal government and a regional arts agency. Some smaller arts groups are still struggling. Jane Roesner Graves is executive director of the Lawrence Children's Choir. JANE ROESNER GRAVES: It was a big impact for us. And actually, for this next year, we will be operating at a 10 percent deficit for the first time in the history of the choir. KORANDA: Her group will soon be asking the City of Lawrence for money to help cover the shortfall. Sarah Fizell is with the advocacy group Kansas Citizens for the Arts. She's standing in the Kansas Statehouse in front of a massive mural of the abolitionist John Brown. SARAH FIZELL: Very much an example of how the people spoke and their voices were heard. I mean, this was thousands of advocates who worked really hard over the last year and a half to explain why the arts were important in their communities, to explain what this meant in their lives. And I really believe that that voice was heard by the governor and by legislators. KORANDA: But there's still plenty of uncertainty. The move puts Kansas back on track to restore matching funds, but the new organization has to be assembled and apply for the funding, and arts groups could still have a difficult year ahead. Kansas likely won't be eligible for arts matching funds until mid-2013. For NPR News, I'm Stephen Koranda in Lawrence, Kansas. Transcript provided by NPR, Copyright National Public Radio.